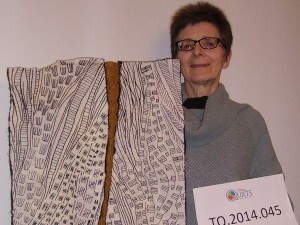 Margaret chose to talk about a contemporary quilt she made, inspired by the bark cloth made by the Mbuti tribe of the Ituri Forest (in the Democratic Republic of Congo). She talks about how the quilt design developed (including tribal history), how she chose fabrics and where the quilt has been displayed. Later Margaret talks about her own journey as a quilter and craftsperson, exploring different materials and developing her skills and knowledge through courses. She also looks into the development of Contemporary quilting as a genre. Fran Katkar [FK]: So, Margaret, we’ve just been taking photos of your Touchstone object. Your very interesting piece of work here. In, in black and white, so perhaps you’d like to tell me about it? Margaret Cooter [MC]: Right, it’s called [cough] ‘On the other side of the river’, a title that arrived very late in the scheme of things. 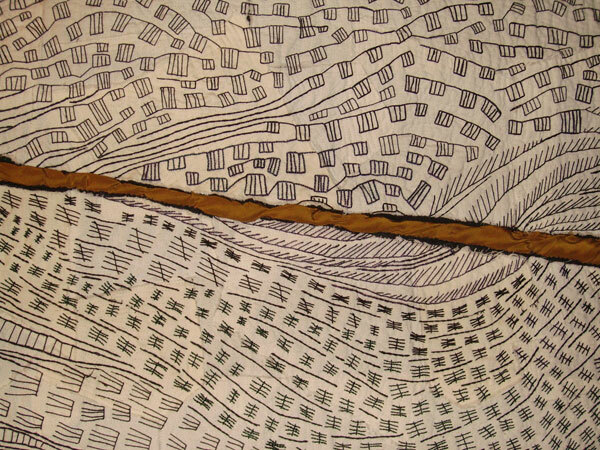 What arrived very early in the scheme of things was a picture on a pamphlet that came from a gallery in central London called Gordon Reese Gallery that used to exist there but no longer does and what they were doing was they were having an exhibition of Mbuti mud cloth, bark cloth, bark cloth, bark cloth. It’s painted with mud but it’s made with bark. It’s made by pigmies in The Congo and the… the pamphlet had this picture and I was just idly looking at it and thinking at how the marks that are made with mud on the cloth, how interesting they would be to stitch and, within about five seconds, the whole quilt had planned itself in my head. Not really planned, I just knew what was going to happen. I didn’t know what it would look like at the end, I just knew how to go about it and, that is how I got started. What I did to make it was, I want, I knew it was going to be hand stitched so I wanted something that would be pleasant to stitch into and that was wool, and I happened to have a pair of trousers, my favourite trousers that used to, I used, they used to be my favourite trousers and then, and then the moths got at them so I could no longer wear them. And so I had the two, I had trouser legs that I cut up and I used as the basis for the stitching. It wasn’t in its current format at that point, though we did, we were working to a specific size and so perhaps, I’m sh… yes, I must have started with these trousers, put a layer of white cloth onto it in patches. You can see, you can see different, different patches in there, some frayed edges. It’s all been, yeah some different kids of fabric. It’s all been quilted down. And, so, first it was just [cough] these kind of rectangular shapes with, with white quilting on them and then I started, with me needle and thread, and I made the first marks and one thing developed into another and the actual stitching just kind of grew organically. And so I had the two, the two panels stitched in different shades of dark threads that I had in my collection at that time. Some are a bit purpley, some are navy blue, some are really, really dark green, some are actually black. Some of them look like when you, when you make fences, and what do you call? Fences and gates? FK: Wattle? Pan, um. Oh, woven? MC: When you, when you, when you make four strokes and then you make the fifth through. Like a sort of tally. FK: Oh. Yes, yes, for counting. Yeah. Anyway, so, I had the, I had in the middle of the, of the quilt I had this Congo River that runs through the area and gives the place its name. I had the, the Congo River in between these two rectangles. And it turned out I was thinking of maybe a red colour or a blue colour or a black colour but I happened to find a lovely ochre coloured, sort of river muddy colour of silk blouse in a charity shop, and so that became, that became the bit in the middle which is actually sort of padded and raised and quite nice and silky to touch really. And so, that, that was what ended up in the middle, dividing the two halves, and at that point when it actually became the river, the, the visualisable, the visible river, when it became the visible river, the title came to me and it was about how you, you do have these two nations on different sides of the, of the same river and how territory is seen very differently today as it would have been when the tribes, perhaps, moved freely across the river, or perhaps, were fenced into their own areas by inter-tribal warfare. 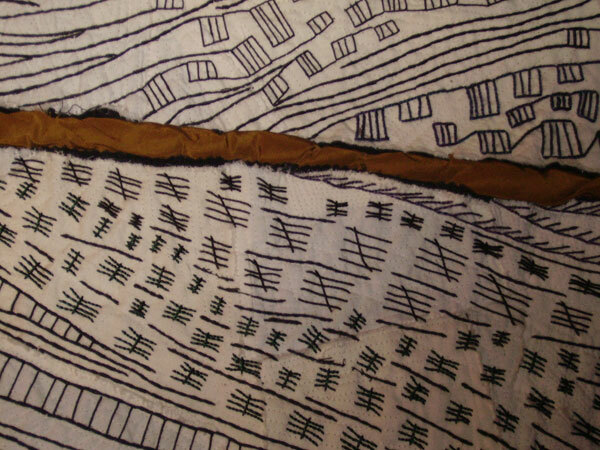 It probably never was a very peaceable river, but the pigmies, the Mbuti, sort of live in the deep forest and seem to have had this culture that produces marvellous cloth with its markings. And that is how the piece became finished. It’s backed with, it’s backed with a solid piece to hide all the ends of threads and whatever from the embroidery and it measures, I don’t know, we were working to a set measurement. I think it’s 90cm long and 49 wide. Something like that. FK: And that was for a particular challenge or exhibition? MC: Yes, that was for the Fissures Challenge that Contemporary Quilt did at the Festival of Quilts. It was their first exhibition that was shown at, at the Festival of Quilts, or possibly their second. I think it might have been their second because they had an exhibition at the Art and Nature Gallery at Twigworth in Shropshire. FK: This was Contemporary Quilts. MC: Contemporary Quilts. And this was the year before I believe and that was shown in Festival of Quilts in its own gallery. FK: So this was 2006? MC: This was 2006. A date that sticks in my mind because 2006 was the second time I had done a Masterclass up at Festival of Quilts. The first, oh no it was the third time, it was the third time. So the first one I did was with Jane Dunnewold, and that was exciting. Three days of dyeing fabric and foiling and printing and such things. MC: Yes, absolutely wonderful. And then the next year I did batik with Els van Baarle and that was good too. And then the third year, 2006, I was all set to do a course with Jo Budd who had just reappeared on the scene after an absence of some years and she was teaching at Festival of Quilts, and I have no idea what the course was going to be like and I had no idea of what Jo Budd looked like. So when I arrived at the class all a dither and said to the person who was there ‘I’ve, I’m afraid I can’t stay. I’ve left my quilt on the train and they’ve got it. They’ve got it at Crewe but I have to go up there and collect it and we need it for the Contemporary Quilt exhibit here.’ and I was in such a dither and, and this, this woman said, ’I’m not Jo Budd. I’m not the teacher. I’m just here to help with the sewing machines. Now just relax, be calm. It’ll all be fine.’ And this dear woman volunteered to drive up to Crewe and collect it for me, and she had returned before lunchtime with my quilt, and I had been able to go to the class, and her name is Barbara and I thank her many times. Every time I look at my quilt I, I think of, of that really, really kind act. That was very generous because it took her three hours and she wouldn’t even take money for petrol. FK: Well, since these interviews are all about our quilting heritage, I, I think that’s another aspect of it there. MC: Yes. It’s, it’s, it’s about the kind of friendliness and helpfulness you find among other people with, you know, the same kinds of concerns. FK: And you were also able to attend the complete workshop. MC: I did, I did and what made it even more vital that it be in the exhibition is that it was one of the quilts chosen to have postcards made of it. Back in those days, postcards were still really important. Now everybody’s taking digital pictures of everything that they, that they enjoy taking and might enjoy looking at once and then completely forget about. It’s an interesting evolution, that. FK: … move on any further? When you were gesticulating and starting to talk about the stitching, your hand immediately went to the centre of the quilt, to the river area so I was wondering whether that was the, the area where you started the, the hand stitching that covers the entire surface. Also whether these two separate long pieces of fabric, whether you had already joined them to make one piece at that point or whether you worked on each one separately and then you did that later. MC: Okay. When I started working on this, I, I did each of the two sides separately. I knew that they would be together in this configuration. One is wider at the top, the other is wider at the bottom and I knew they would be together like this, to fit into the size requirements, but I did work on them separately, and sometimes I would work on an area of one and then leave it for a while and do something on the other side, and I would always be putting them down next to each other so that the patterning would kind of balance itself out. And I didn’t join them until I found this fabric, this silk fabric for the middle, for the fissure shall we say. This kind of river valley that, that runs through it, and then, and then I used that separate back to actually attach all the bits to. FK: Hmm. That’s, that’s very interesting and, as we can see, the result is a very graphic piece of work with the strong contrast of the, the black against the white and the, as you’ve described so well, the variety of the stitches covering the entire surface. MC: It’s mark making really. What, you know, we later come to call mark making. Yeah. And I just so enjoyed making it. It was such a pleasure. I, I knew where it was going but I, it was a surprise to me what it actually ended up looking like. FK: So the intention was always for this piece of work to hang on the wall? FK: Yeah. And do you have any plans for it now, ahead? MC: No, I have refused to sell it. I think it’s, it’s probably, it’s a piece really was kind of a turning point for me. That kind of burst of realisation and then the evolution of, of first of all building up the layers of wool and calico and then adding on the stitches and then putting it together in its final format. That, that was quite satisfying, the way that it, that it actually worked out smoothly. FK: And that’s a very good answer to my next question. How you feel about this piece of work? MC: Yes indeed. It’s… I, because I so enjoyed it I really, I don’t know. I could have sold it but I didn’t want to. I didn’t want to. FK: No, it’s, it’s too significant to you isn’t it? Yes, so maybe that leads us in very nicely to how your work has developed and, say, your work before that point and then since that point. MC: Okay, we’re talking about a lot of years here, because I started quilting in the 1970s when there was a kind of a revival. There was a book called the Perfect Patchwork Primer by Beth and Geoffrey Gutcheon, and that was my bible for a while. I made several quilts out of that. Planned them out on graph paper; loved the colouring in. All that was such, such a pleasure and to see how a little change in the pattern could make it, could make it very different. So I did a lot of this kind of straightforward, traditional quilting and I helped some other people make their own quilts as well, which was really enjoyable. They were just amazed that they could do this and so I did that for maybe like 10 years. FK: … private group in your home or? MC: One of them was someone at work who had always wanted to make a quilt and I said ‘Oh, I’ll show you.’ And she did, and, you know, I just kind of showed her and I think she bought a book as well and she was, she was a nurse and she didn’t have all that much time but she produced this double bed sized quilt, and, well the top anyway. And I can’t remember what happened with getting actually layered up and quilted because this was when I lived in Calgary, Alberta and I was only there for a year and then we moved on, so I, I do hope she actually finished that. She was just at that stage as we were leaving again. Another person was my sister-in-law, who also lived in Calgary, and then when I lived in Halifax, Nova Scotia I was at library school there and one of the people in the class was having a baby so the rest of us made them a, a quilt. Each of us made a block and they did fabulously. I just said, ‘Look, if you can’t think of anything just, you know, get a kids’ colouring book and, and use a picture from there’ and so we put all that together. I don’t have a photo, unfortunately. I would have liked to. And I always used to make baby quilts for people’s new babies, ‘cause it’s that time of your life when your, you know, your friends are all having babies. Yeah. FK: Was this because quilting was always around when you were, during your time in Canada? Did you grow up with quilting as part of the general culture? MC: Not quilting as such but we… all the children were encouraged to things with their hands in my family, and my mother sewed and knitted. My grandmother did as well. And so there was a kind of busy, you know, don’t have idle hands attitude in, in, in my family, but during the time when I started quilting there was a lot of, a lot of it about. You know, it was a big revival and there were quilt shops and there was a wonderful place in Nova Scotia called ‘Sea Winds and Suttles’. I forget what suttles are, something maritime, and they made the most wonderful quilt, patchwork waistcoats and jackets, and they cost quite a bit of money and there was someone in my library school class who had one and, my goodness, I was envious, because at the time there was no money for that kind of thing. FK: Interesting, yeah. So you were, you were moving along and enjoying sharing skills with friends. FK: And appeared in London Quilters. MC: Okay there’s a bit of, let’s see, a lot of my time when I came back to the UK. First came to the UK in 1971 and went back to Canada because my husband was doing some post-doctoral placements. When back to Canada in ‘77 and, or ‘8, and then came back to the UK in ‘83. So at that time I was living in Oxford and had a library research job and then I moved to London after a year. And, London Quilters? I wasn’t actually for the first few of those London years actually quilting, but by the time I came back to it. I wonder how I got to London Quilters? Do you know, I absolutely can’t remember. I can’t remember. I do remember going, someone took me along to a meeting at a church in Primrose Hill, or a, you know, a church hall in Primrose Hill where Linda Seward had just published a book and she was talking about it. So that must have been quite a while ago. FK: There’s a community centre there. FK: Yes. Where she has, she and other people have spoken about quilting. MC: So I went to that but I didn’t actually join at that point. I joined several years later. I can’t remember. FK: So, think it was around 199… No around 2000 and I, yeah, I remember seeing you there and then at a certain point I distinctly remember you were starting to show pieces of your work after every monthly meeting. FK: How, how was that come about? That you had something to show us every single month? MC: Well, it came about in two ways. One way was that I had been asked to do a seminar, a series of seminars at a conference in Australia and so I wasn’t very confident about doing public speaking and so I kind of set myself the challenge to get in a bit of practice that would help with the, with the confidence and I thought about where I could practice this and London Quilters came to mind. Show and tell to the rescue. And so in order to get in as much practice as possible I had, actually had to have something to show and that was the, the other direction that this came from. So I had been making various things and I thought, well I will just, you know, just take them, finish them. They were probably small quilts, weren’t they Fran? Quite, quite small. FK: As far as I remember, yes. MC: And I would just go up to the front, and like everyone else who goes up to the front, me knees were knocking a bit and out would come this thin little voice which got stronger over time I think. And then after I came back from Australia I just continued doing this, and it was about that time, because I went there in 2005, at that time that Contemporary Quilt which is another group I belong to and have since, oh I don’t know, about 2004. Since then, at that point, sorry, at that point Contemporary Quilt was starting up its journal quilt challenges and that involved making a quilt every month throughout the year and there would be certain parameters set by the group such as they would be A4 size, or one year they were six by 12 inches and another year they were ten inches square. Things like that. And so I would make these little quilts and sort of hold them up at the front of the room. I’m afraid most people couldn’t see but you talk about them a bit, don’t you, and they kind of get an idea. So I would just continue talking about things and bringing something most meetings to, to show. FK: And what was so interesting was that every month, I think, I think it was when you started doing these journal quilts, every month I think you decided yourself you were going to look at a different technique or a method or a material, because that was striking because what you were showing us each month wasn’t more of the same. [MC:Hmm.] It was, how, how did, so you, yeah, how did that come about that you were exploring in so many directions? FK: This was a list of? MC: Of, non-traditional quilt makers. AQL. Alternative Quilts. It’s not a term you hear anymore, is it? MC: Yes because people would give on, on their posts on, on the lists, they would give links to things and it sent you looking at all sorts of things. And they would talk about their own work and some of them, is it possible that some of them had blogs? I don’t think so. It might have been a bit early for that. FK: That explains why each month we never quite knew what you were going to show us. MC: Well, it was what came up, wasn’t it? MC: Yeah. Did I ever use paper in those days? MC: AQL is this good list. It had various challenges and they weren’t all making challenges. There was a challenge where you, where you chose an artist and wrote about the artist and it didn’t even have to be related to, to quilts. It could just be some artist that took your fancy and different people posted at different times and there would be like one a week and I volunteered to coordinate that, you know, we had a nice steady stream of these. And that got me a little bolder about actually writing my own posts on the list because at first when you start out with these new things like the internet, like oh, like Yahoo groups, like Contemporary Quilts has a Yahoo group. And, and it takes a bit nerve to make your first post, to come out of ‘lurk-dom’ and be a participant. So it takes a bit of nerve to do that and yet it’s very rewarding when you actually do participate and contribute and you really, you really feel part of a group then. FK: This was all just developing really. FK: That’s an interesting point because I know sort of ten, fifteen years ago, what you just said is very true. It was really the quilters we focussed on tended to have won a great prize at a, a national event so that’s, that’s interesting that she was perhaps far-sighted enough to be looking in that direction. FK: That was my early days I think. MC: Yeah. Well, if only we could sort of pin the dates down we could get a nice timeline, couldn’t we. Another project. FK: And then, does that bring us on your particular timeline? Does that bring us more or less to the point where something resulted in you making a substantial change to your daily, weekly work pattern? MC: I think it must have been around then. Around then. Certainly I had made this change before I went to Australia which was a work related trip at my job which was as an editor on a medical journal. The journal had quite a liberal policy; people could work at home one day a week in those days and you could have a kind of flexible hours. Because everyone just had a job to do, they got on with the job. That journal had to come out every week and you just did it. You either stayed late or arrived early and I was able to negotiate that my normal working hours would be 10:30 to 7:30, which suited me fine because I’m an early riser. I’m bright as a button at the beginning of the day. I like to do all my important things, you know, the interesting things then. And so I was in the studio and 10 o’clock I would down tools and run off to the tube and go and do me job. And that worked out really, really well. FK: So, yeah, so, you told us about this one evening at London Quilters that you’d made that conscious decision to buy out that, that piece of good quality time at the beginning of each day, which was a wonderful decision to enable you to progress with your own work. And had the, had the idea come from somebody else? MC: It did. It did. And I’m just trying to think of who. FK: Hmm, yes, it’s running now. Yes. MC: Okay. 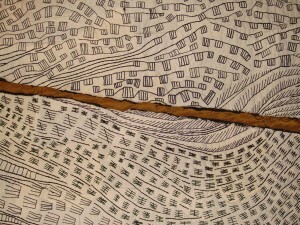 The person that I’ve remembered who put the idea into my mind was Barbara Lee Smith who is an American textile artist. She lives in the San Juan Islands, the north west of the United States which is quite near Vancouver which is where I come from, and so I felt an immediate connection, of course. She had a special exhibition in The Barbican, in The Curve, as part of The Art of The Stitch show. I don’t remember what year it was but I do remember that I’d been to some conference in, in Holland, just before Christmas and I had, I caught a virus and I absolutely had no energy and she was giving a talk at the end of March. And I thought ‘Right. I will go to this talk’, [coughs] excuse me. And so I took myself off to the talk, still not feeling energetic, and she gave a great talk about her work which were these kind of pillars inspired by underneath piers, encrusted with barnacles [coughs]. And at the end, she asked for questions, and I was, I’d being feeling particularly stressed at work and unable to do any of my creative things, and so I said ‘Do you have any tips for the time challenged?’ ‘Cause there didn’t seem to be enough hours in the day. And she said a very few words. She said ‘Do the most important thing at your best time.’ Which made me think, what is the most important thing? And that was my creative work. Not that my job wasn’t creative. I mean, I loved that job. So I decided to follow her advice and thought about how I could do this and, I knew that people were working at home and other people were working some flex time, so I took the bold step and there was no problem and that’s how it went on. FK: … a strong turn so that you created that time for yourself to enable you to produce and progress your won work. Yeah. MC: I was lucky to have the situation that could do that, yes. Otherwise I don’t know what would have happened. FK: So at the time you’d, you’d already joined the Contemporary Quilt group and very much enjoyed that, by the sound of it, and then that lead on to other directions. MC: Yes. It did. It did. Contemporary Quilt group had summer schools and so I was able to do some more workshops there. I was always on the lookout for a good workshop, you know. I did some with London Quilters, did some with Contemporary Quilt, did some at Festival of Quilts. I also did classes in creative textiles and that was really important to me. In fact, that was time ago that I started those in about ’92 at City Lit. Julia Caprara was Head of Textiles then and I was able to take a number of termly and yearly courses with her. Plus there were all sorts of one day courses. On a Saturday she brought in people like Constance Howard and Michael Brennan Wood. And it was fabulous and it was all about developing your own work rather than doing set things. It was about learning new techniques. It was, it was embroidery essentially. I was interested in embroidery at the time but quilting? You know, it could easily segway into quilting and then, you know, ten years later it had. There was this fusion of embellishment that arose from embroidery and other such techniques; felting… what else? Did we do dyeing there? No, we didn’t do dyeing there. We did indigo there. It was really exciting and I also did drawing and some painting courses there as well. But what was your question, Fran? FK: Sound wonderful to be developing all of that gradually while you had your full time job. FK: Then it’s all building up to what you’ve done more recently. No, I was just asking about, about, sort of, other developments from joining Contemporary Quilts and then the other, other courses you’ve gone on to do and how, how your creative area has developed. FK: But you haven’t stayed completely with fabrics, have you? 0:41:46 MC: No I’ve sort of diverged and that’s good, I think, and with Contemporary Quilt, because the, sort of contemporary quilt idea is such a very broad one, it can be anything really – felt, paper, all sorts of things. FK: I think paper has been mentioned. MC: Yes. Yes, yes. I’m a big fan of paper. Well, you know, I like books a lot, and I’ll get onto that in a minute. So, yes, in Contemporary Quilt, I also got involved in the committee of the organisation and, and I was doing publicity for a while which was a bit, I don’t know, it was in the early days. Then I did membership. Keeping track of our members’ list so that we could contact them by email and post and whatever, and now, currently, I have just started a three year stint as the newsletter editor, so I’m looking forward to doing that because I also did the newsletter for Region 1 of The Quilters’ Guild for a while. FK: So what, yes, belonging to Quilters’ Guild or Contemporary Quilt group, what, how has that helped you in your, your own development, or what have you got from each of them, or London Quilters, or is there anything that comes to mind? MC: Photography! Photography, writing. Yeah. Lots of, it’s a good way to, to meet people and I really enjoyed that and I’ve enjoyed being involved in it because that’s the way you meet the most people. You know, ‘the more we put in, the more we get out’. It’s a true-ism. FK: We do get to know each other by working with each other. MC: Yes, that’s true. And it’s, it’s, I mean working with each other, we’re just even sitting there just all stitching together and it’s a lovely atmosphere, isn’t it? FK: How often do you meet in contact with quilters? MC: Not very often. Our main forum is online really and there is the newsletter and there is Festival of Quilts where Contemporary Quilt always has a, a stand and it’s a, you know, a kind of focus for people to go there and say hello to each other. FK: What would you say to people was the reason why Contemporary Quilt was set up in the first place? What’s its role? MC: Well, I think, I think it’s a kind of alternative to Traditional Quilt, really. 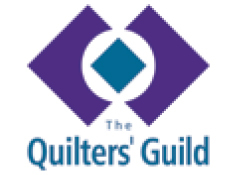 I think now The Quilters’ Guild has five specialist groups. They’ve just recently, last year, started a Modern Quilt group, and there’s a Miniature and a Traditional and, what? A Quilt Study group, which deals with history of quilts, as well as Contemporary Quilt, and Contemporary Quilt is, is the largest one of these. We have about 800 members now, all over the country and also outside of the UK. We have about a couple of dozen members outside the UK. Yeah, so we’ve really, really grown from when I first joined when there were maybe 200 members. MC: Yeah, share information. To have challenges like these exhibitions and they get a good number of entries. There’s, there, there isn’t enough space to hang them all so there’s a jurying process. So, you know, there’s a certain kind of standard that has to be met. There’s the fun of making the journal quilts which go into a photo area of the Yahoo group and it’s through that Yahoo group that people communicate. They have talks online really. FK: to hire a place. You, it’s, this is the format. MC: This is the format, but there, there are a couple of events, I said there’s the Festival of Quilts, and then there is Summer School and recently there’s been Winter School as well. So, in June, in October, there‘s a chance to go away for a weekend and do a course with someone, and meet new people, meet people you’ve already met and that is a very good atmosphere. Very interesting thing to do I think. FK: Yeah, definitely. And the chance to spend that time together. FK: Have, just have more time together rather than sending messages, yeah. FK: How interesting! And then, and then, at some point that led onto doing a course at Camberwell College of Arts. MC: Well, it did and that arose from my early morning working in the studio because I thought, ‘Oh, I’d love to do this all day! 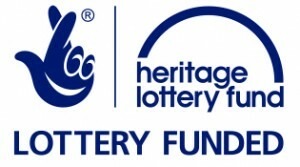 And soon I will retire, and when I retire I will do this all day.’ Well, it hasn’t worked out like that because as soon as I, as soon as I stopped full-time work I then went on to do an art foundation course at City Lit, where I had done so many other courses in the past. And continue to do courses! And the art foundation course lasted for four terms and it was a real eye-opener. We had a number of, of areas of making that we, that we spent, I think, six weeks, oh, no three weeks, doing each of them, kind of a taster. Textiles was one, ceramics, graphics, painting. We also did some life study, sculpture. And so we got, you know, an exposure to different areas of art, some of it applied art, some of it fine art. And then for the final two terms we chose two of theses areas, and I chose ceramics and sculpture, and we then worked towards our final show. And that was all very, very interesting to do. And after I got through that, I applied, because they did have you filling out applications for different colleges because it’s kind of a measure of the success of the course, for the institution, as to how many people go on to further education in the area. So applied to Camberwell which has a course which I always wanted to do called Book Arts. And I’d been interested in making books and different book structures and I’d dabbled in it in the past. And so I applied to Camberwell and got accepted for that and then spent the next two years doing Book Arts, which was wonderful, again! New friends, with similar interests, and exciting new areas of art to explore and, also, within the course the, the kind of mindset of making art. About having an intention, knowing, you know, what the work comes out of. It doesn’t just arrive because you happen to drop two fabrics on the floor and they happen to look nice together. You know, there’s actually a matter of ‘Oh, yes! At least if we’ve got this complimentarity of colour and yet it doesn’t, there’s something slightly edgy to it. It reminds me of barbed wire and inner city boundaries so I’ll do a piece that’s all about, about alienation in the city.’ and then finding the ways to, to carry that through to a successful end product. And thinking ahead of time about how it’s going to be displayed, how to write an artist’s statement. All those, those kind of art mindset things and you do, you do write a lot of rubbish in the art statements, I must say, when you’re in college, but it stands you in good stead for deciphering art-speak later. FK: That sounds like an excellent way to start anyone’s retirement! FK: So I know we didn’t see so much of you at London Quilters while you were on the course. FK: You were bringing in some of your pieces of work including the books and that was interesting for many of us to see. MC: Yes. I felt, though, that, well, there wasn’t really the time to get there and I felt it was kind of getting away from quilting but recently I’ve been, become quite excited about using paper to make quilts whether, whether entirely paper or paper in connection with, with textiles. And also I’ve been quite excited recently about using sort of pleated fabric where you heat set the pleats in a synthetic fabric to dip into porcelain and see how the, the fabric, the soggy, clay-filled fabric will then be able to be formed into other shapes. So that’s a kind of 3-D development and, and it’s also making the, the soft textiles into this hard, fired ceramic object. So that’s the, my developments so far. FK: We were just looking at some of them. You have them at the other side of the room. These interesting small pieces are, as you say, set like china but based on fabric, different kinds of interesting shapes, and before that you were showing me a piece of work that you keep on the go and keep adding to but that basically is stitching on paper. MC: Well, it is and I wonder whether, technically, it can be called a quilt because it is three layers joined by stitch. There’s the layer of the, the background which is a, a colour catcher which you use in your laundry, a synthetic sheet, that I then colour black with ink and there are narrow strips cut from the newspaper and folded in half. And each of those strips is then sewn with a running stitch to the background and when it comes to the end you make, you make a sort of little, almost like a prairie point. MC: You turn it at 45 degrees and turn over the fabric so it then continues on the back and then you go to the other edge, do the same. Just keep doing that, just keep going back and forth, back and forth. So that at any point it has the three layers; the two layers of the newspaper and the layer of the background and they’re held with this running stitch. FK: The thread is in coloured embroidery thread. So the thread is an important part of it. MC: And the thread, there’s, there’s a kind of a, it’s a kind of a time based piece. Not just in the time I spend doing it but it’s, by using the newspaper, and you could theoretically perhaps unpick what the headlines are or sometimes there’s an actual date given and I like to put those in, so it’s, it, it’s the actual time of the newspaper and the time of, the era of the making and there’s the time spent making it and there’s also the history of those threads because they come to me from other people whose mothers died and left sewing things behind and people have passed these on to me as a sort of way to, for these items to still be useful. And I suppose I shall pass them on to someone, eventually. FK: Yes, that’s an, an understandable feeling, isn’t it? FK: And this piece that you showed me that you keep adding to which is like a long scroll of this fabric that you’re creating with the, the paper and the stitch, I think there’s a, there’s a parallel, I think, to another series that you’ve also had running when you travel on London underground. MC: Ah, yes, there is. Yes, there is. Indeed, there is. I’m glad you have a good grasp of my work, Fran, because when you, when you’re talking about it there are some things just escape you. FK: That’s another important series. MC: It is. It is. And this is something that I evolved out of the clear blue sky during my foundation course and it became very important because it was the basis of my project for the MA and I call them travel lines because they are written or drawn while I’m travelling, sitting on the tube or on a train or on the bus and I just hold my pen above the paper so that it writes on the paper and I move it to one side to the other. And what happens is that you can’t make a straight line this way because the vehicle is jolting and juddering over the surface and bouncing you around and bouncing the pen on the page and there’s all sorts of interesting lines form because of that. And so during my MA I did a lot of textile printing, of screen printing, of screens made from my drawings of these lines and so I have a nice drawer full of fabrics that I use in, in various projects. For instance, I have been making sort of travelling on the go kits where you can carry your tools with you as you travel. One carries book binding tools and it’s called A Binders Keeper and another one carries sewing tools and it’s called A Sewing Companion. I did call it Sew-on-the-Go at one point, but it just didn’t work, just didn’t work. So it’s A Sewing Companion and it’s good because you can have a little hand-sized tool roll that you can easily carry things with you. And I use a, I make them in a, in a patchwork kind of manner. They use between 13 and 18 fabrics each and some of those fabrics are from my travel line fabric. So those, I’ll show you those later, Fran. FK: We must take some pictures of them as well. FK: That’s a, that’s a series that’s been running for some time isn’t it? FK: As you said, having printed a lot of it on fabric, then although it started on paper, it could be the basis for any future fabric projects, fabric and stitch, mark making, for you. FK: And was it around the time of your foundation year that you gave an exhibition of your work in the local area here? FK: That was a combination of textile work as well as some of your paper work at that point. MC: Yes, textile and paper and it was called Journey and it also showed my partner’s photographs because he’d just been on a sailing trip in a, in a very old boat and so he took wonderful pictures of the sails and such and, and my work for the foundation course had been about this, these travel lines and also a ceramic kind of sculptural piece. FK: So that’s been a, a very interesting and comprehensive look at your, your progression and all these areas of work you’re involved in. Perhaps a final question? Why is quiltmaking and these other areas of creativity, why, why is it all so important in your life? MC: Whoa! That’s a good question. Well, it’s important because I like doing things with my hands and I like doing things that you can see. I do, I do some writing as well and you can see that because it goes up on, it goes up on the web and on various sites and, and it can be seen but somehow having something tangible that you, it’s, it’s great. And I also like that you take some raw materials and you transform them. You take different kinds of fabric. You put them together in various ways. You think about how to do it, you play with moving them and then, you know, something comes of it. FK: Something that didn’t exist before. FK: I think that leads me to an additional question, that, that because of your own progression, do you feel able to sell any of your work or do you regard it as very much your own development and that your, you would like to keep all your work that you’ve produced so far? MC: I have sold various pieces and in fact last summer when we had an open studio I sold a piece that was also quite seminal in my development and that was a bit of a wrench and I put a, I put a hefty price on it and someone wanted it and that was a wonderful thing! So off it went and it’s now in a new home. FK: And you’re comfortable with that? MC: I’m comfortable with that. I think the thing is don’t under price things. If it, if it means something to you think about, about what you’re letting it go for. FK: Was that, by the sound of it, was that also quite exhilarating that someone appreciated your work that much? MC: Yes, yes, and, and another outcome of this, this open house was that I had written about it and documented it on my blog and someone who had seen my work at a, at the, at an exhibition in France and who lives in America, quite near where Barbara Lee Smith, the person who’s wise words changed my life, she contacted me and wanted to buy a piece and so I sent it over to her. And so [FK: Lovely] that’s an international sale [FK: Wow].which is sort of, oh, unexpected bonus. So that was really, that was really amazing, yeah. FK: Is that something that gives you pleasure when you do exhibit your work, wherever that happens to be? Do you positively enjoy people coming and enjoying what you’ve produced? MC: Yes and I hope it would encourage them to, to just keep on with what they, what they’re doing and maybe, you know, think about different things. FK: Yes, the quilting world is so wide, isn’t it? MC: So many possibilities, so little time. FK: That’s a lovely point at which to end. Thank you very much Margaret.